These bears were made from a wool sweater that I felted in the washing machine and dryer. I hand embroidered the eyes, nose, mouth, and muzzle as well as blanket-stitched around the body. 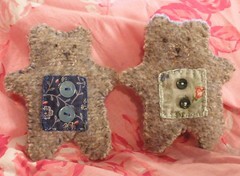 There is a fabric square on the middle that I blanket-stitched onto the bear; and hand-sewed two buttons on the fabric. This was inspired by a picture I saw on a Flickr site. Thought it was cute and wanted to make with the felted wool I had. The bears are small – they fit into the palm of one’s hand. The blue bear I kept and will give to Olivia on the first day she goes to the homeschool co-op. (Kind of like a teddy bear she can hide in her pocket.) The green bear I sent as part of a “Recycle Your Clothing” swap on Swap-bot. I also made these felted cat toys this week. 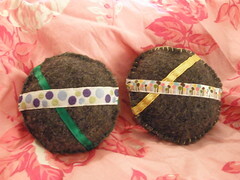 These each are stuffed with wool from sheep I use to raise and have a jingle bell inside. Needless to say, the cats enjoy the toy because they can get the bell to make a noise the more they play with it and toss it around. Another item I made was a coaster for a mug. Saw this idea on the internet, and thought I’d give it a try. Basically, you cut off the hems from jeans you no longer wear. Using a hot glue gun, you glue the hems together to create a very sturdy and dense coaster. 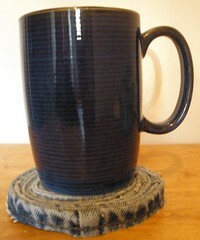 I used 7 pairs of jeans (14 hems) to create one coaster. It took a lot more hems than I thought. 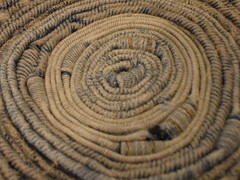 The next step is to use the fabric from the jeans to create items for the home (a quilt…more placemats…not sure yet). I love these little bears. I love these ideas. Those bears are darling. And I'm always looking for good ideas for all the jeans my little boys wear out. I'll have to try these.